Vittorio's Voyages: 2009, The Year Without a Summer? 2009, The Year Without a Summer? Many folks in the Great Lakes / Northeast region have deemed this year as the "one without a summer." 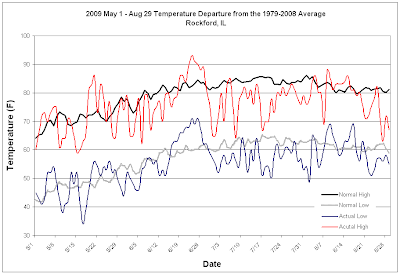 Take a look at the graph below showing the temperature departures from the latest 30 year average for Rockford, IL. After cool, dry northwesterly flow to the start of May kept severe weather and temperatures cooler than average across a good chunk of the central/eastern U.S., temperatures quickly bumped up to well above average in the back half of June under periods of southwesterly flow (and hence an increase in moisture & severe weather reports). For the majority of July and August, the Great Lakes and Northeast region have been back under northwesterly flow aloft. Sometimes, this flow aloft can be interesting in the mid August time period as MCSs (and occasionally derechos) can be spawn near the upper-level jet stream. However, this flow has lasted for such a long time (and has been so deep latitude wise) that cold fronts have routinely made it to the central Gulf of Mexico. This has in turn left the Midwest with well below average dewpoints for the majority of July and August, and thus little severe weather to talk about.